The Minister of Education, Science and Technological Development of the Republic of Serbia, Dr. Srdjan Verbić visited on Monday, August 8th 2016 the Astronomical Station (ASV) at the Vidojevica mountain. He was accompanied by Dr. Milovan Šuvakov, Assistant Minister for Higher Education and Development and Dr. Antun Balaž from the Institute of Physics, Chairman of the Board of Directors of the the Astronomical Observatory of Belgrade (AOB). In Prokuplje they were joined by Ms. Maja Randjelović member of a council of the Prokuplje Municipality. They were hosted by Dr. Zorica Cvetković, deputy director of AOB, Dr. Rade Pavlović, member of the AOB staff and Mr. Miodrag Sekulić, observer at the ASV. Dr. Verbić emphasized the importance of the new telescope ``Milanković'' and the Vidojevica Astronomical Station. He added that it is important for Serbia to define which infrastructure is needed to be competitive and that there is a willingness to participate in the projects for which there are existing human resources and funds. He also added that the Astronomical Station at Vidojevica is one of such places. Dr. Cvetković on behalf of the AOB highlighted the fact that the AOB is the only professional institution in Serbia which performs astronomical research in Serbia and that the first observations made with the ``Milanković'' telescope are very promising. 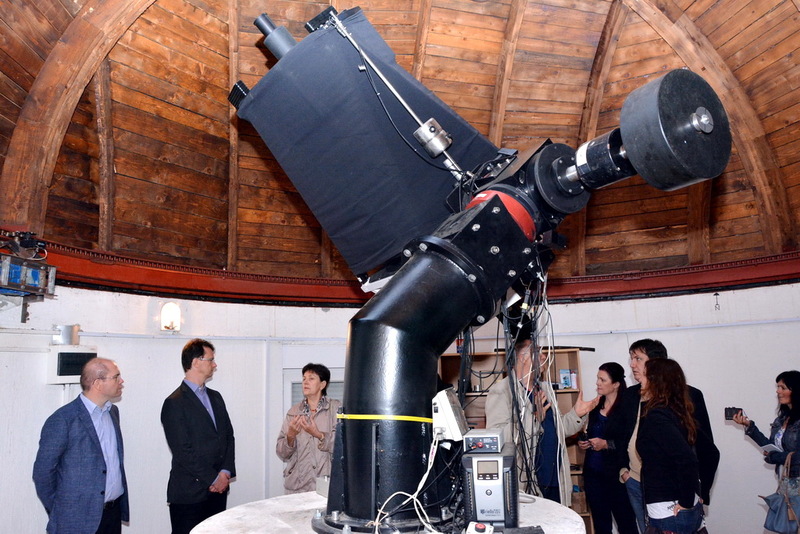 The visit was very well covered in the media and it was emphasized that the main source of funding for the purchase of the ``Milanković'' telescope came from the European Union through the BELISSIMA project and that the Serbian Ministry supported financially the project and that it will continue to support the work of the Vidojevica Astronomical Station and the AOB in the future. Visit to pavilion of the 60 cm telescope. From left to right: Dr. Antun Balaž, Dr. Srdjan Verbić, Dr. Zorica Cvetković, Dr. Rade Pavlović and Dr. Miodrag Šuvakov. 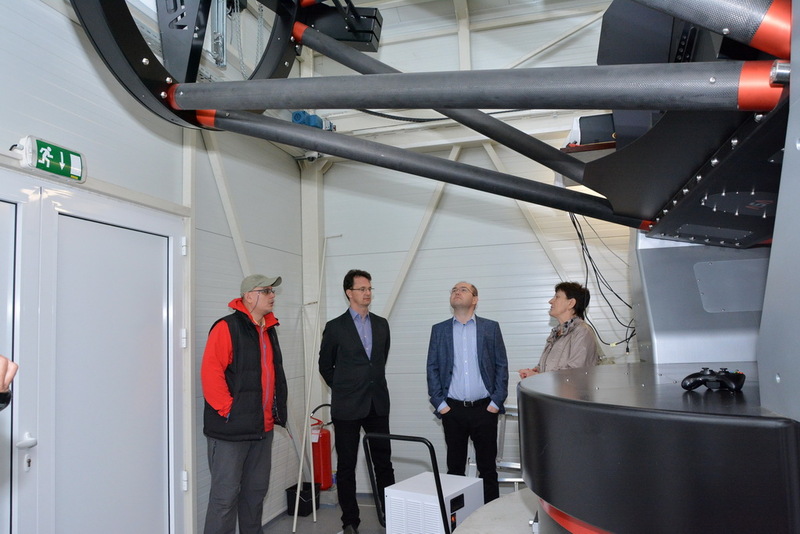 Visit to the pavilion of the ``Milanković'' telescope. From left to right: Mr. Miodrag Sekulić, Dr. Srdjan Verbić, Dr. Antun Balaž and Dr. Zorica Cvetković. In front of the pavilion of the ``Milanković'' telescope. From left to right: Dr. Antun Balaž, Dr. Miodrag Šuvakov, Ms. Maja Randjelović, Dr. Srdjan Verbić, Dr. Zorica Cvetković and Dr. Rade Pavlović. We thank Mr. Dragi Stojković (Topličke vesti) for the photos.